Found a few goodies waiting for us when we arrived home from vacation. We weren't sure if anything would survive these crazy hot temperatures, so these were a pleasant surprise. 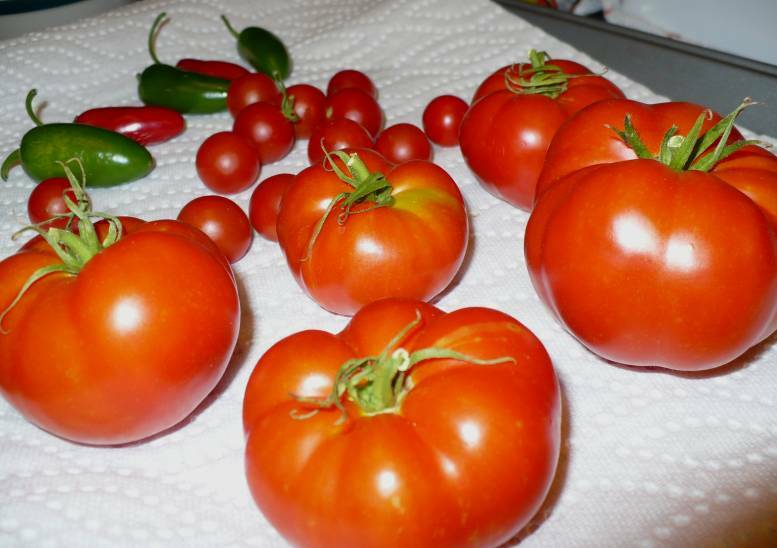 The tomato plant was labeled as a Big Boy, but these appear to be heirlooms. They are meaty and creased more like an heirloom. Either way, they are delicious. The peppers are Tam (mild) Jalapeno peppers and at about 3" long, they do pack a punch. I'm thinking maybe a small batch of salsa and some Grilled Tomatoes with Basil are in our future.